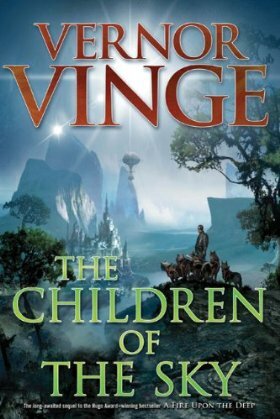 The Children of the Sky is a a typically wonderful tale from a master storyteller in Vinge. It is only in comparison to the iconic A Fire Upon the Deep that it fails to live up to expectations. Even then, if a third book is forthcoming then all of the groundwork being laid in Children becomes truly brilliant, crafted with subtlety and providing exactly enough information to fire the imagination and plant questions for what is to come. Since I don’t know if that book is ever going to be written, I’m giving a provisional rating to The Children of the Sky. As a sequel only, it gets an 8/10, but if it is a bridge book…frankly, it is one of the best that I have ever read and worthy of a 10/10. Since I believe Vinge is too good a storyteller to have done all of this setup by accident, I’m going on the assumption that book three will be coming and calling it 10/10. After I posted the review, Kristen wrote to Tor to try to find out if another book was planned. Kristen’s contact couldn’t confirm or deny another book (understandably). While it’s not really word either way, I’ve decided to change my final rating of the book to an 8 rather than a 10 to reflect the facts on the table rather than my guess.